The Tower of Hercules is a lighthouse of Roman origin that is used as such until today. The Romans constructed the Farum Brigantium at the end of the 1st century or beginning of the 2nd. Its use was not continuous, during the Middle Ages it fell into disrepair. 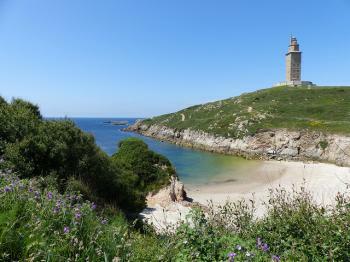 The lighthouse became of interest again during the 15th century, when La Coruña became an important port. Major reconstruction work was done in the 18th century. Its current form is in the neo-classical style. The current structure is 55 metres tall, while the Roman core is 34 metres. It stands on Eiras peninsula to guard Galician coastline at the North Atlantic coast of Spain. As I'm the first one to review this 2009 addition to the List, let's start with the practical details. 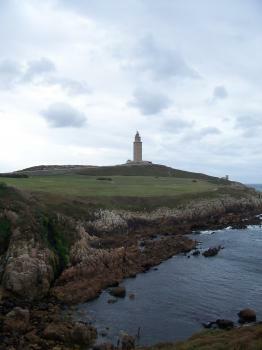 The Tower is located at the tip of a peninsula in the north of the city of La Coruña (that's A Coruña in Galician). It is well signposted from there too. Although it's only a couple of kilometres from the city centre, I'd recommend not to walk from there (quite boring) but go to the site directly. There's a huge parking lot on the peninsula, but not really anything else besides toilets and an ice cream stall. Hundreds of other visitors where present when I visited the site on a Tuesday in August. It was already a popular destination before it became a WHS (120,000 visitors in 2006), and I guess now these numbers will become even higher. The Tower / Lighthouse can be climbed all to the top. Entrance costs 2.5 EUR. I didn't really want to go up in my current condition, but buying the ticket is the only way to see some of the interior. Fortunately there are several points at which you can turn around or exit. The climb starts at the base, where the Roman foundations can be seen. The tower is called a 'Roman Lighthouse', but most of what you see dates from the 18th century. The Roman lighthouse (or what's left of that) is 'inside' the bigger current lighthouse (like a mathruska doll). ICOMOS applauded its 'functional integrity' more than its Roman features - it was and still is a lighthouse. The stairs are easy to walk on and there are ample places to rest. I turned around about half way. Next to the lighthouse is a stone building that apparently houses the ex-voto of its construction. I wondered what it was for, but couldn't open my notes due to the strong winds blowing at the site! When the lighthouse was inscribed this year, the thing that amazed me the most was that a nearby sculpture park, rock carvings and a muslim cemetery were included too. The only reason I can think of is that they wanted to protect the entire peninsula as core zone. So that way some other structures came in too. However, there's also a large sports complex at the same location which they conveniently declared as being in the buffer zone. It's pleasant enough to walk on the peninsula and let the wind and the sun touch you. Some of the sculptures and the muslim cemetery are located quite far from the rest, behind the sports center. I didn't go there. A complete visit of the peninsula probably takes about 2 hours. And you can bring your own picknick lunch as there are several nice spots to sit and watch the sea and the ships passing by. Probably our shortest World Heritage site visit so far, even shorter than the plague column in Olomouc! The tower itself is very impressive, though most of what you can see isn't the original Roman construction. We had hoped to climb the lighthouse and have a nice view back across to La Coruna and the harbour, but as you'll see in the video below it was unbelievably windy and the tower was closed! All there was for it was to walk around the tower a couple of times, admire it from each direction, and then depart. I visited this WHS in May 2016. 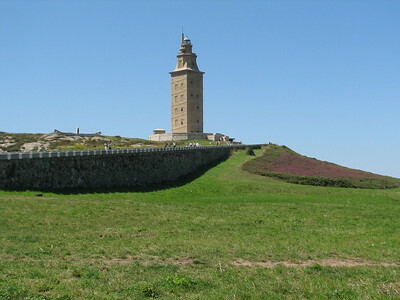 The Tower of Hercules is one of the highlights of Galicia and A Coruna's landmark. Yet, its geographic position being rather remote is such that it does not attract so many foreign tourists. In fact there are no bars, restaurants, souvenir shops or hotels in the immediate vicinity of the tower. The surrounding sculpture park (containing also minor petroglyphs) is also inscribed, most probably as a huge buffer zone to protect the site from urban sprawl. The natural setting is indeed beautiful with a lovely sandy beach, rocky cliffs and birdwatching trails. I was quite lucky as I visited on a lovely sunny day with only a cool pleasant breeze. The walk towards the tower does NOT offer the best views. Instead if you visit in the afternoon, head left from the small visitor centre away from the tower and you'll enjoy magnificent panoramic views of the tower, the sandy beach and the rocky cliffs. I visited on a Monday so the entrance to the tower was free. The Roman foundations can be viewed as soon as you enter the tower. The stairs are quite wide and sturdy so I'd really recommend the extra effort. The ventilation is excellent too. The view from the top is quite something and you'll be able to appreciate why the sculpture park was added (just look at the urban sprawl of A Coruna and then compare it to the beautiful natural setting surrounding the tower!). I visited by car (parking is also free) from Santiago and after a rewarding visit together with a small picnic at the park I drove to the Asturias. All in all I think it deserves its place on the list as the only fully preserved Roman lighthouse that is still used for maritime signaling. An early finish to my Camino gave me a day spare to venture north to A Coruña and visit the windiest WHS so far. The lighthouse is quite impressive and can be seen from a fair distance away back on the Western beach in A Coruña. It is a very fine looking tower, but it is not really that 'Roman' and has not even been continually used as Lighthouse for the entirety of its life. However there are some Roman remains buried underneath it and I got a view of these when I went inside. They were about as interesting as a selection of dimly lit rocks can be. There were repairs going on to the Tower so I wasn't able to climb it. I then headed on out to see the surrounding additions to the inscription on the peninsula. It was a little bit of a way to get to the furthest points so I took the opportunity to hire a Segway (second time at a WHS this year) and head of to the extremities. This proved to be a very enjoyable way of getting to see some of the abstract sculptures and the small Muslim cemetery. Quite what these have to do with the lighthouse I am not sure, however it does mean that this rather lovely part of the coastline is left free of development, and I found it an exceptionally rewarding place to be blown around by the increasingly strong winds. If you ever really want to see how to make an application to get inscribed on the World Heritage list then I would recommend spending a bit of time looking at the application for this site. It manages to tick every box, include seemingly non related things in the inscription and make rather large claims about the anti-seismic construction methods. However this aside, it does do a good job of illustrating how the Romans set up a navigational site here for when they turned their attention to the Atlantic as well as the Mediterranean sea routes. Despite my slightly dismissive comments here, I do think there is a fair bit of worth in the site's inscription, and the inclusion of the remaining parts of peninsular although seeming unrelated actually helps preserve the locale. A Coruña itself was a pretty nice city, with a walled old town and a fine city beach, although the train station is a long way from the city centre and the Tower is even further still. After a pretty long walk to the beach I managed to hop on a charming old tram that does a loop of the isthmus on which the city is situated; this dropped me off right at the access to the tower. I actually really enjoyed my trip to this site. It is perhaps not the most impressive WHS but it does help to illustrate how navigation has been continually improved on the European Atlantic coast. Worthy of a stop if you want to blow away a few cobwebs for an hour or two. Hercules: Wiki: "According to a myth that blends Celtic and Greco-Roman elements, the hero Hercules slew the giant tyrant Geryon after three days and three nights of continuous battle. Hercules then - in a Celtic gesture - buried the head of Geryon with his weapons and ordered that a city be built on the site. The lighthouse atop a skull and crossbones representing the buried head of Hercules' slain enemy appears in the coat-of-arms of the city of Corunna."